Key Brain Connection Slow To Develop In Kids With ADHD : Shots - Health News A network in the brain that helps control daydreaming seem to be slower to develop in children with attention deficit hyperactivity disorder. 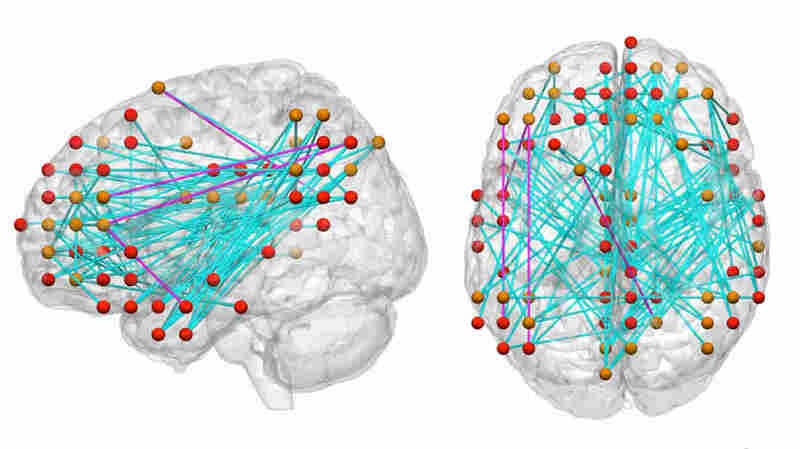 Maps of connections in the brain are helping researchers better understand attention deficit hyperactivity disorder. Scientists analyzing data from a map of connections inside the human brain have gained new insights into the development of attention deficit hyperactivity disorder. Past images of brain structures showed that the brains of people with ADHD mature later than those of people without the condition. Now researchers making use of data collected as part of something called the ADHD-200 Initiative (similar to the Human Connectome Project) have found that the growth of connections within and between key brain networks in children with ADHD lags behind what happens in other kids the same age. The results, published Monday in the Proceedings of the National Academy of Sciences, point to a reduced ability among children with ADHD to turn on and off the networks inside the brain that are involved in control and attention. The brain connections that normally help children focus simply aren't as developed. "Ultimately the brain is an information processing machine and that process occurs in the connections between regions," University of Michigan psychiatry professor Chandra Sripada, lead author of the study, tells Shots. "So the real test of the maturation hypothesis ... is looking at the connectome rather than structure." The researchers used two different databases looking at the connections in brains of 576 children with ADHD and normally developing children. In particular, the scientists assessed 907 known points across the brain and calculated how strongly linked each unique pair was in both groups of children. They found that one neural network in particular lagged behind when it came to children with ADHD. This area, called the default network, is responsible for your stream of consciousness, or daydreaming. It turns on when you're not actively engaged in tasks and turns off when you're busy. "The default network is maturing very rapidly between youth and adulthood," says Sripada. "It's neither a hero nor villain — you need to be able to turn it on appropriately and turn it off appropriately." Without this ability, researchers suspect that children can't focus on tasks or think further into the future. Their daydreaming network interrupts the area of their brain working on tasks, causing a loss of attention. The study "makes a lot of intuitive sense," Philip Shaw, an ADHD researcher at the National Institutes for Health and unaffiliated with the study tells Shots. "We know the connections within the brain are very plastic ... treatments could work by boosting these connections." Sripada agrees, saying that the research might enable people to identify brain connection patterns earlier and develop treatments to target abnormal circuits. For the kids who eventually grow out of ADHD, there may even be a future where understanding the brain's connections could lead to better knowledge of how the brain will mature. "You could tell a mom, you've got a kid with ADHD," Sripada says, "and, by the way, our expectation is at a certain point your kid will outgrow this." An earlier version of this post incorrectly described the ADHD-200 Initiative. It is similar to, but not part of the Human Connectome Project.